Great 1st collection of Leann!! Starts off with the smash "Blue" wich had country music on its ear!! great 1st song. Then goes into more fun upbeat songs like "one Way Ticket" "My BabY" and "Good Lookin Man" these songs keep the album alive and fresh sounding and keep me listening again and again!! Ends with the beautiful song "Fade To Blue" wich is a great song to end an album with, with a sound of Dolly Parten, i think!! Shows Leann at the age of 11 years old, great voice but with a younger sound to it!! Great Country Rocker Cd, with the bouncy "I wanna Be a Cowboys sweetheart", "Rest is History" and "Blue Moon Of Kentucky". also includes the Dolly Partons song "I will Always Love You" wich she hit the notes with ease!! 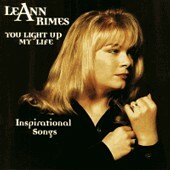 You will Find Leann at her Country Best on this collection, Followed by "Blue"
This collection includs great inspirational/Gospel songs including "You Light Up My Life" "Clinging To a Saving Hand" "Amazing Grace". Yes some you have heard before, but Leann Puts her own touch to them and makes them her own! !When your in the mood for a good Gospel Song or Insirational song i suggest you listen to this collection. Also includes the hit singles "How Do I Live" and "On The Side of Angels". Now this collection you will find something for everyone!! You have the country songs like in "These Arms Of Mine", "All The Lovin' And Hurtin'", and "The Heart Never Forgets" to the pop sounding with "Feels Like Home" and "Insensitive" to the rock sounders wich include "Rock Me" and "Sittin' On Top Of The World" and to the todays county as in "Undeniable", "Surrender" and more, so many songs to choose from!! Really something for everyone!! This collection wil get you Up and Rockin and Dancing!! COUNTRY....If you like leann of the country songs, this is the collection for you, wich includes remakes of geat country artist like Patsy Clines "Crazy" and "Leavin' On Your Mind" and other remakes from artist such as Kris Kristoferson, Marty Robbins, and Buck Owens..This CD is sure to take your heart!! Great Country Tunes. Aslo includes "Your Cheatin' Heart", "Love Sick Blues" and the hit "Big Deal"!! 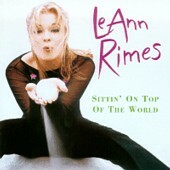 This cd was unexpected by Leann Rimes and the fans. Here you will find leann more on the pop side of country with songs like "You Are", "Written In The Stars", and "Soon" to the REAL COUNTRY OF "Together, Forever, Always". This Cd includes songs from the "coyote ugly" sound track "But i do love you" and "Cant fight the moon light" This is in my opinion not her best and will not be her best cd, all other leann cd's top this one! But still any Leann Fan...gotta get it!